This Thursday we are one of the stops on the Dreamwalker Blog Tour hosted by AToMR Book Blog Tours. Fans of the paranormal and Greek mythology will want to add this title to their reading lists. We share our thoughts in our review and there is a giveaway. Getting dumped by her boyfriend sends Noel into a type of depression. She stays in her room and doesn't go to work so she gets fired. Two for two. What's a sad girl to do? Noel begins to dream..... About a hot guy. But not some nameless face. He feels familiar to her. And by that I mean something stronger, a bond like a soulmate. This guy, Jared, then tells Noel he should not have gotten her involved in his world, an otherworld of supernatural creatures like vampires, witches and more. When he is kidnapped, Noel has to flee along with her best friend, Autumn, and another hot guy named Boone who happens to be Jared's partner. How life changes for Noel (new prospect at love, her own identity questioned and revealed, then a fight for survival) within a few days is what makes Dreamwalker a fun, exciting read. At the beginning she may come across as weak and simpering but this also makes her real. Who doesn't get upset when their significant other (of three years) breaks up with them? But as the story evolves, so does Noel as she finds herself in a world she never imagined with not one but two good looking guys. Not only does she like both guys, she learns about herself, dream walkers and other things she never thought existed. 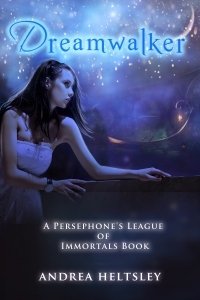 I have to say Andrea Heltsley has done it again--entertained me with her array of interesting characters, exciting worlds and beings, and included Greek mythology and Persephone's League of Immortals, Hell, a love triangle and more. Bestie Autumn was a hoot and a welcome addition to this tale. Usually I can pick the guy I want the main heroine to wind up with in a story but I'm definitely torn between about declaring my alliance to Team Jared or Team Boone. There were times I wanted to know more about Persephone's "League" and thought the worldbuilding needed to be flushed out more so I hope this is covered in the next installment. There were some instances where I felt there was more "telling" going on than showing; still, not enough to hinder my reading. The story's mostly steady pacing kept me involved and I enjoyed the twists this story took. I anxiously await the next book in this series, Divine Destiny (2013) to find out how Noel and her friends figure out how to defeat Persephone and her gang. Cover comment: Andrea has some of THE prettiest covers ever. Colorful images, pretty girls, a nice blend of dark and blue. I used to lean towards Dissolve as being my favorite but then I saw the covers for the author's other books, Dancing With Death and Divine Destiny, and can't decide so I love them all! Book source: I received a promotional eARC from the author in return for my honest review during a book tour. the book looks really interesting. i haven't read any of andrea's work before but once i manage to find work i'll be sure to buy a copy of this book!